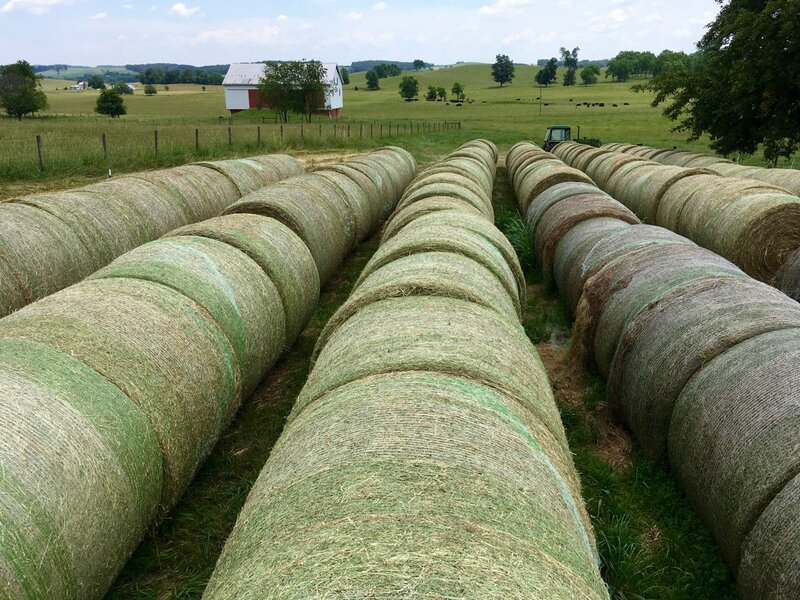 Making hay on the farm in Swoope, VA. Each 6X6 foot bale weighs about 1,000 pounds. June is the beginning of the farm year for our cow/calf operation in America’s legendary Shenandoah Valley. It’s when the bulls go in with our three herds of cows. June is also when we make all the hay to feed the cows for the entire winter. Catalpa trees, super highways for pollinators are in full bloom. The evenings are cool and we love to sit on the porch with a glass of wine at dusk and wait for the bats to drop out of the bat house. As we wait, we hear Robins fuss and a Catbird “meowing” as they settle in for the evening. Hundreds of fireflies flicker their tailights in the distance. The first bat drops out of the box ten feet straight down then lifts off in flight to feed on multitudes of insects throughout the night. Then another, then two more, then another until all seventeen have dropped out. 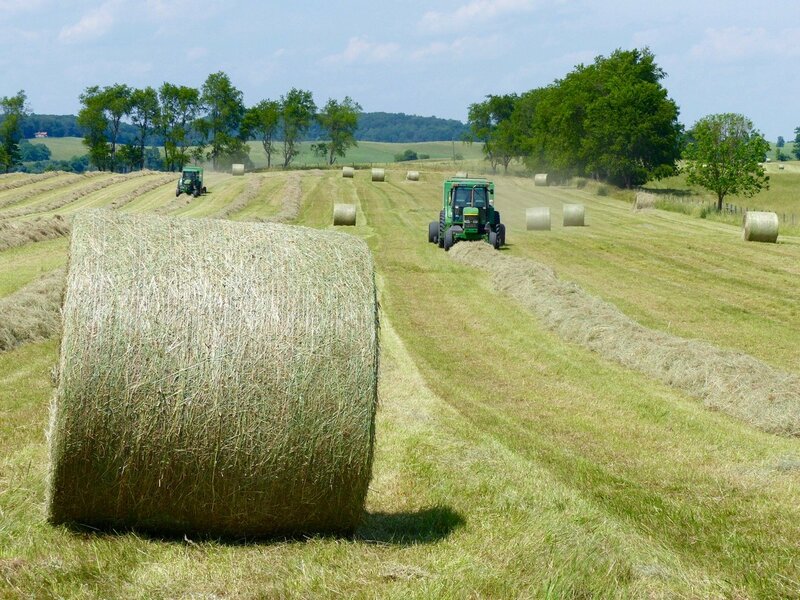 June is when we harvest carbon – the carbon sequestered by the grasses we cut for hay. It’s amazing – a cow digesting grass. We cut the grasses in our hay fields, let it dry then bale it into half-ton round bales that we’ll feed this winter when the pastures are dormant. I love the smell of hay. For some odd reason I love putting it up. It’s a wonderful feeling; knowing you have food for the cows for the entire winter. I like to think of making hay as baling sunshine. Afterall, sunlight and green plants make it possible for us to make hay and for all humanity to live. A cache of hay bales on the farm. Each bale weighs about 1,000 pounds and will feed 50 cows for one day during the winter. A photon from a ray of sunshine hits a chloroplast in a leaf and the journey begins – photosynthesis: the most profound of all ecosystem services. Photo…synthesis…it provides virtually all our food either directly or indirectly and virtually all our oxygen. Remember the Calvin Cycle? Hill’s Reaction? In a nutshell plants take in carbon dioxide and water and use the sun’s energy to convert it into carbohydrates. In the process plants give off the Earth’s oxygen. And the world turns. Catalpa trees are in full bloom. They never cease to amaze me. The white, orchid-like, perfect blossoms almost completely cover the tree during June. Catalpa tree in full bloom at the river in Swoope, VA. It’s a super highway for pollinators. They are a super highway for pollinators. Standing near a tree at the river, I can hear hundreds of pollinators: bees, moths, bugs, flies. No wonder, the fragrance and flower design are magnets to them. The blossom is huge with a runway pattern of yellow and maroon to guide pollinators into the sweet spot – where all the nectar and pollen reside. 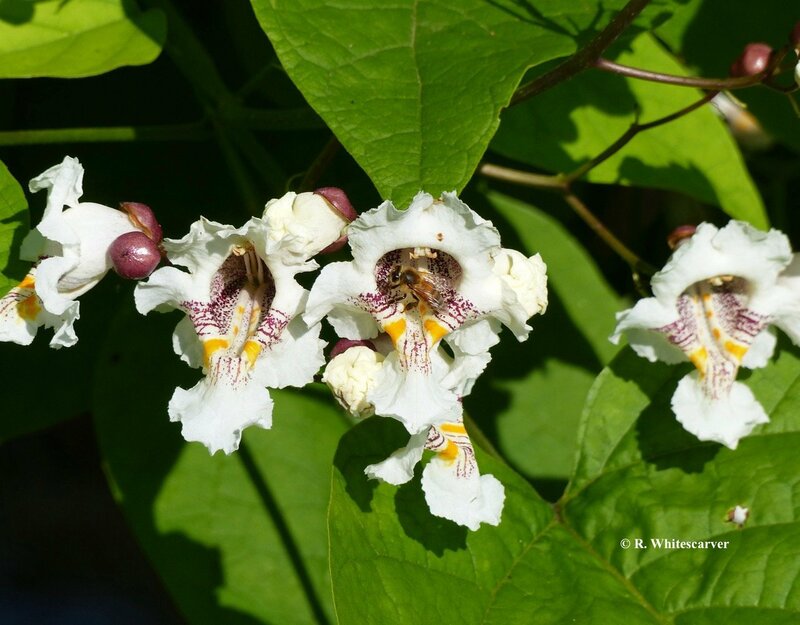 Catalpa blossoms have a runway pattern to help guide pollinators to the treasure. 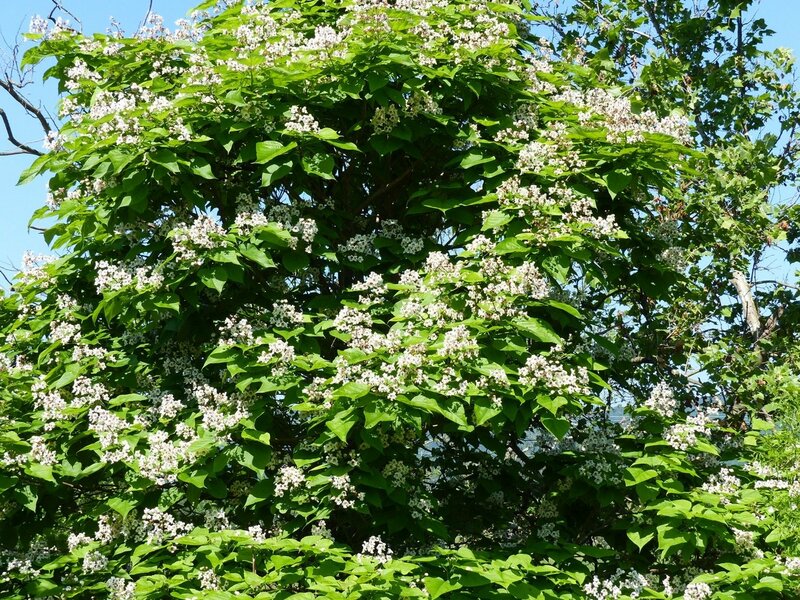 Catalpa, often called Indian Cigar Tree because of its long seed pods or beans it produces in the fall is a native, pioneer tree that is an excellent riparian buffer tree. It is a host specific plant for the Catalpa Sphinx moth which is often parasitized by wasps. 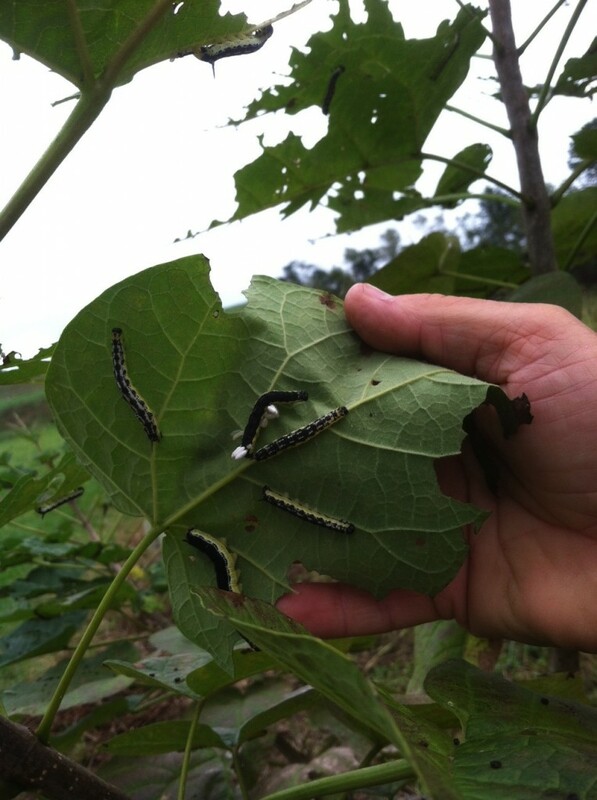 The caterpillars make excellent fish bait and there are farms that grow Catalpa trees to harvest the “worms” for bait. In 1736 Colonial Williamsburg Royal Governor William Gooch planted two rows of Catalpa trees to line the Palace Green. They were replanted in 1937 and stand today as a testament to their beauty and grandure. Wonderful! Well said and beautiful. Phyllis and I always enjoy your insights. You help us to know more about this wonderous valley we call home. PS you might like to check out the RACC (Rockbridge Area Conservation Council) website’s new Climate Change module. Thanks Fred, good to hear from you. I’ll bet it’s beautiful at your place this morning. I often call our making hay, wrapping a string around a little piece of solar fuel for our biological power units – the working draft horses, Suffolk Punch in our case of course. It truly is captured solar energy and is especially useful to power the farming and forestry we do with our horses. Not to mention the fact that the manure goes back on the same ground, steadily increasing organic matter content annually. Nice post as usual Bobby, keep up the good work. Oh and our biological fuel units are still small square bales put in a barn loft, just to prove I’m still old fashioned. For me the trade off of labor saving doesn’t justify the waste of high quality legume/grass (Birdsfoot Trefoil – Climax Timothy) hay kept in round bales outdoors. Although since we now have a growing herd of Red Poll cattle to compliment our Suffolk horses and giving us 2/3 thirds of the traditional Suffolk livestock trident, we waste some in round bales too. The issue is not enough eyes to acres or hands in the fields, so we make hay on land to keep it in ag use all over the community, the same everywhere I imagine. Good to see you still working sir. Are those Catalpa trees native? Jason, thanks for stopping in and for your words of wisdom…as usual. Yes, both Northern and Southern Catalpa are native but to be honest I don’t know which species we have in Swoope. Whatever it is, its a great tree. Bobby, enjoyed your post, as always. That is an awesome sight, all that hay! Does it go into a barn? I sometimes see it plastic-wrapped in the fields around here. Anne, I thought of your lament as that construction went on…the paving of the Earth continues. As many of the bales as possible will go in a barn, maybe 50. The rest will be stored outside in caches as in the picture. We have five “hay lots” or caches. Always a pleasure to hear from you. Keep up the good work. Another masterpiece, Bobby. You’re a perceptive young man. In olden times, a theory goes, the megafauna ate the catalpa beans and distributed them on their travels, including the uplands. With he mastodons and mammoths and giant ground sloths gone the catalpa is mostly distributed by water now, like the row on the Middle River across from Grandma Moses’ house. Your work in the CREP program gave that catalpa grove a place to start. Now would you mind bringing back the megafauna? Put a few catalpas back on the hillsides? Thank you Michael for your very kind words and information about the megafauna. We had an upland field of tall fescue that we killed and planted to native prairie grasses. When we killed it, possibly 50 catalpa trees emerged. I believe the fescue had something to do with the seeds not germinating or dieing. Even when we graze that field many of those catalpas remain and we hope they keep growing. I came across your post through an old Friend. You’re in the area where many of my Ancestors came from. My Dad always loved Catalpas. Maybe it was inherited. He taught me to love them too and I now have one in my front yard in Kansas. Mine came from a seed planted in a flower pot from a place we were temporarily living. So you probably grow a tree from a seed pod. It’s about 12 years old and easily as tall as any of the older trees in our neighborhood that were mostly planted in the 1940’s. Linda, it was very nice of you to post your comment, thank you. I am so appreciative of the hard work from all the farmers and ranchers. But don’t we depend a lot on fossil fuels to get the jobs done? Charlie, thanks for stopping in. Yes, we indeed depend on fossil fuels in agriculture. But, we need to move away from them. When I worked for NRCS we had a program to supplement farmers for using bio-deisel fuel. A deisel engine can run on 100% soybean oil. Now, there are debates about putting food in the fuel tank, and I have written on these pages about the inherent risks of growing annual crops and especially soybeans, but it can be done in a sustainable manner.